In a many-particle system, two ring polymers interact through a potential U/P only between beads with the same index, as the next figure illustrates. This mapping of quantum particles onto the statistics of ring polymers is known as the “classical isomorphism”, a concept introduced by Chandler and Wolynes J. Chem. Phys. 74, 4078 (1981). Path integrals can be sampled via Monte Carlo or molecular dynamics algorithms as we showed in J. Chem. Phys. 99, 2796 (1993). where RA and RB are the centers of the two cages, μAB is a vector joining these two centers, and the coordinate of the two atoms in the molecule are clearly specified. The accompanying figure shows the classical and quantum free energy profiles as a function of this coordinate at temperatures of 8 K, 17 K, 25 K, 50K, 100 K, and 200 K. Quantum is in red, classical in blue. 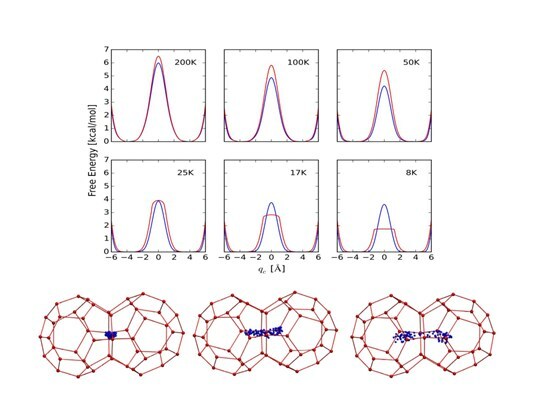 Along with this figure, we show several snapshots of the hydrogen molecule at the transition state at 50 K (left), 25 K (middle), and 8 K (right). We see that the quantum profiles have a higher barrier at higher temperatures, while at lower temperatures, the flattening of the quantum profile is a clear indication of tunneling, which we see as the delocalization of the path integral across the transition state. The fact that the quantum barrier is higher at higher temperatures is due to the delocalization of both the hydrogen molecule and the water molecules around the ring, making it more difficult to “squeeze” the hydrogen molecule through the ring. However, as the temperature is lowered, deep tunneling gives rise to a substantially lower barrier. This case represents an example of competing quantum effects that change the nature of the barrier as the temperature is varied. This work was published in Phys. Chem. Chem. Phys. 18, 32169 (2016). Feynman path integrals can be combined with ab initio molecular dynamics in order to treat chemical reactions. Details of the methodology are described in J. Chem. Phys. 104, 5579 (1996). A simple example of this is the internal proton transfer of a proton through a hydrogen bond in the molecule malonaldehyde. The accompanying figure shows a path integral snapshot of the molecule with the proton at the transition state and the classical and quantum free energy profiles as a function of the difference between the covalent and hydrogen bond distances. A third profile shows what is obtained if only the transferring proton is treated quantum mechanically. Here we see that there is a dramatic change in the profile between quantum and classical, but importantly, the difference seen when only the transferring proton is treated quantum mechanically points to quantum effects of the nuclear skeleton supporting the transferring proton. This work is published in Phys. Rev. Lett. 86, 4946 (2001). 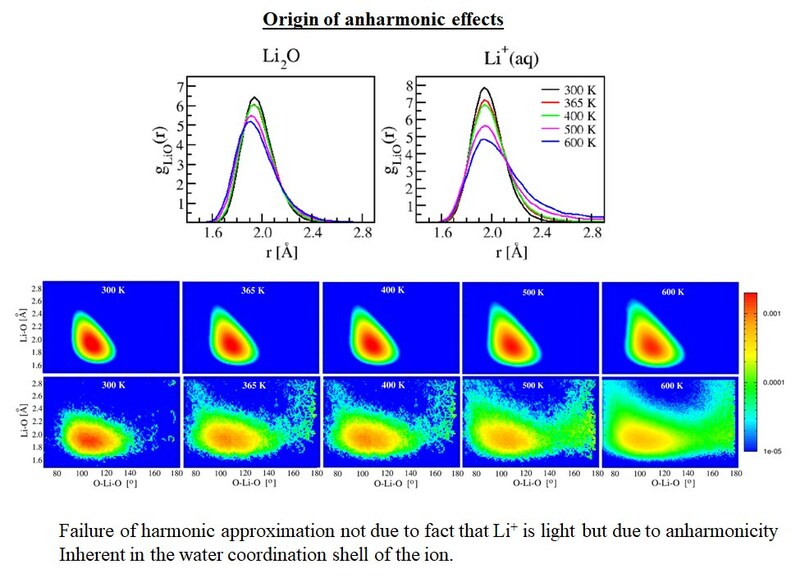 We have also applied ab initio path integral molecular dynamics to the transport of hydronium and hydroxide ions in bulk water, which can be found in two publications in Nature, 397, 601 (1999) and 417, 925 (2002). 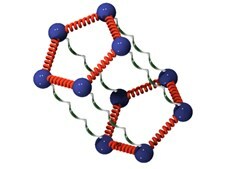 An illustrative snapshot shows the delocalization of the hydronium ion in water. In order to demonstrate how the charge defect can span several hydrogen bonds, we traverse the beads in each water molecule, and if a particular bead is also the hydronium oxygen, we color it yellow. This snapshot then shows that the hydronium need not be located at one particular oxygen site in a given quantum configuration. Equilibrium fractionation of stable isotopes is important in fields ranging from chemistry (medicinal chemistry, electrochemistry, geochemistry, and nuclear chemistry) to environmental science. 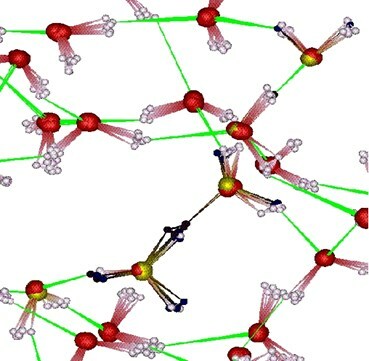 A lack of reliable estimates of equilibrium fractionation factors, from experiment or from natural observations, has created a need for accurate computational approaches. Isotope fractionation is a purely quantum mechanical phenomenon, yet exact calculation of fractionation factors is nontrivial. Consequently, a severe approximation is often made, in which it is assumed that the system can be decomposed into a set of independent harmonic oscillators (the so-called harmonic approximation). Reliance on this often crude approximation is one of the primary reasons that theoretical prediction of isotope fractionation has lagged behind experiment. 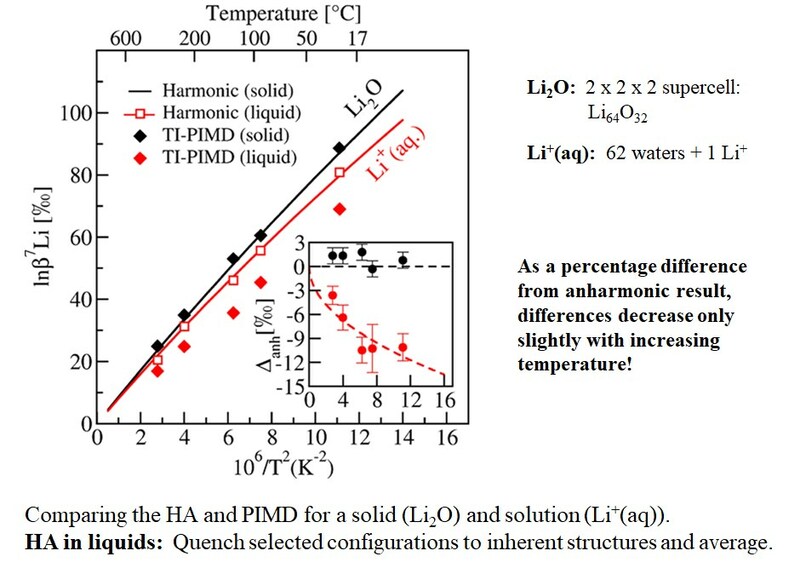 A class of problems for which one might expect the harmonic approximation to perform most poorly is the isotopic fractionation between solid and solution phases provided that the coordination structure around the solutes exhibits strong anharmonicity. It turns out that this is the case in a surprisingly large number of systems. 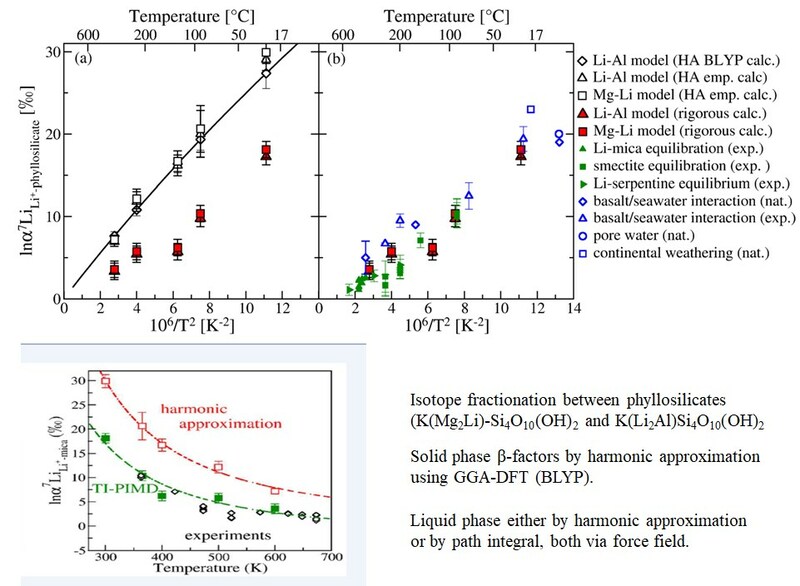 In order to illustrate the errors associated with the harmonic approximation, we have considered the fractionation of Li isotopes between aqueous solution and phyllosilicate minerals, where we find that the harmonic approximation overestimates isotope fractionation factors by as much as 30% at 25 °C. Lithium is a particularly interesting species to examine, as natural lithium isotope signatures provide information about hydrothermal processes, carbon cycle, and regulation of the Earth’s climate by continental alteration. Further, separation of lithium isotopes is of growing interest in the nuclear industry due to a need for pure 6Li and 7Li isotopes. Moving beyond the harmonic approximation entails performing exact quantum calculations, which can be achieved using the Feynman path integral formulation of quantum statistical mechanics. Recent developments of efficient path integral approaches for the exact calculation of isotope fractionation now allow the case of the aforementioned dissolved Li fractionation properties to be studied in detail. Applying this technique, we find that the calculations yield results that are in good agreement with both experimental data and natural observations. Importantly, path integral methods, being fully atomistic, allow us to identify the origins of anharmonic effects and to make reliable predictions at temperatures that are experimentally inaccessible yet are, nevertheless, relevant for natural phenomena.